Hoodies & Sweatshirt There are 14 products. Men's printed hoodie. Material: cotton, polyester, cashmere. With pockets. Please select a type and correct size. Men's hoodie sweater. Material: cashmere, cotton. With zippers, pockets. Please select a color and correct size. 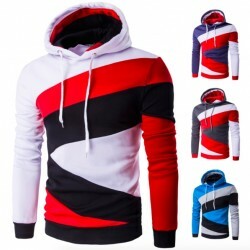 Fashion, men's hoodie. With zipper, pockets. Material: polyester, cotton. Please select a type and correct size.NOTE! Sizes are Asian, please use the chart to choose the correct size. European and American customers are advised to take 2-3 sizes bigger. 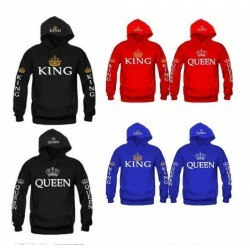 King & Queen, printed hoodie for Him & Her. Material: cotton, polyester. Please select a type and correct size. NOTE! Sizes are Asian, please use the chart to choose the correct size. European and American customers are advised to take 2-3 sizes bigger. 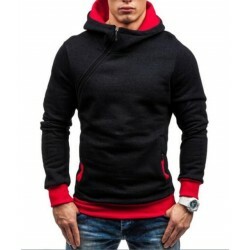 Slim Fit Casual Men's Sweatshirt Hoodie. Material: acetate, polyester. Please select a type and size. 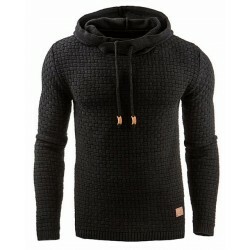 Fashion Men's Hoodies. Material: polyester, cotton. Please select a type and size. Men's hoodies, sweatshirt. Material: polyester, cotton. Closure type: zipper. Type: slim. Please select a type and size. 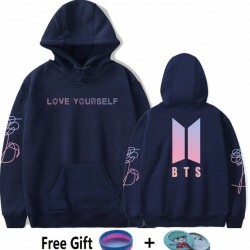 Men's hoodie, t-shirt. Material: cotton, polyester. Collar: V-neck. Please select a type and size.